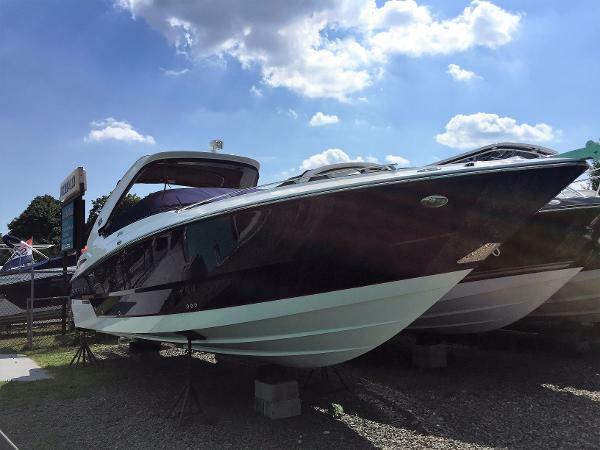 2015 Monterey 328 Super Sport 2015 MONTEREY 328 SS This boat has been kept in dry storage and is Immaculate! One owner with only 110 hours this is a must see!!! Equipped with a custom walk in head and sink, microwave, t.v., lounge seating and so many more extras. It's the perfect boat for family fun or taking friends out to watch one of our beautiful sunsets. 2013 Monterey 328 Super Sport The 328SS is in a class of its own. 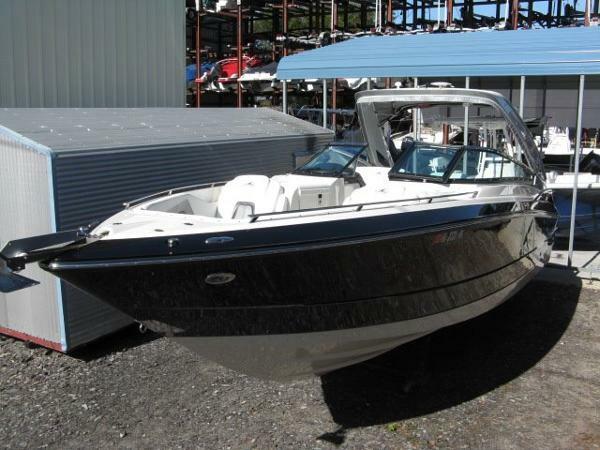 32'2" in length, this twin engine bowrider is a sleek and smooth machine packing a powerful punch. Features include a Monterey exclusive articulating sun island allowing for multiple seating and lounging configurations, a full head compartment with hot and cold water, and a spacious cabin that can accommodate two. Bring your family and friends along, seating areas are plentiful aboard the 328SS. Radar arch, and well appointed wet bar are only a few of the long list of standards available. This boat is located at the factory it has 165 Hours with twin Volvo 300 HP motors. Can be seen by appointment. 2017 Monterey 328 Super Sport 2017 MONTEREY 328 SUPER SPORT WITH TWIN MERCRUISER 6.2L DTS (600HP TOTAL HP) BRAVO III OUTDRIVES; BRAND NEW 2017 MODELS ARE HERE!!! THE ULTIMATE LUXURY BOWRIDER WITH A CABIN AND FULL STAND UP HEAD!! Yacht Certified. Loaded Up with Axius Joystick Control, Sky Hook, Mercury Smart Craft Gauges and Smart Craft Digital Throttles. Beautiful Titanium and Sterling Hull Color with Titanium Hull Bottom. Stainless Steel Anchor and Windlass, Docking Lights, Trim Tabs, Hot and Cold Fresh Water Transom Shower, SeaDek Swim Platform Inlay, Bimini Top with Full Enclosure, Bow and Cockpit Covers, Cockpit Table, Cockpit Wet Bar with Refrigerator, Upgraded Fusion Stereo with Wet Sounds 6 Channel Amplifier, Sub Woofer and 6 Wet Sounds Speakers, Cabin Sleeps Up to 2 People. Microwave, Flat Screen TV, DVD Player, Full Stand Up Head with Shower, Sink, Full Marine Head with Electric Flush, Dockside Pump Out and Macerated Overboard Discharge, 12 Volt Cabin A/C, Shore Power, Titanium Painted Arch and So Much More......You Won't Find a Nicer Luxury Bowrider!!! 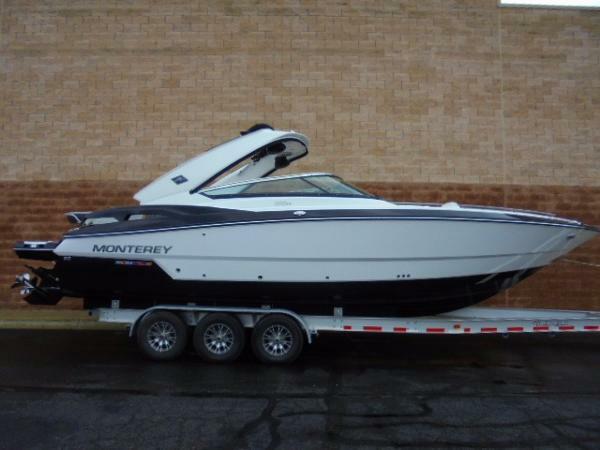 2011 Monterey 328 Super Sport 2011 MONTEREY 328 SUPER SPORT 25TH ANNIVERSARY ADDITION WITH TWIN MERCRUISER 350 MAGNUM DTS BRAVO III; Excellent Condition! Kept in Dry Storage Since New, Twenty Fifth Anniversary Package, Black and White Hull Color with Silver Accents, Quick and Quiet Exhaust, Digital Throttle, Axius Joystick Control, RayMarine E90 GPS, Bow Filler Cushions, Windlass Anchor, Docking Lights, Underwater LED Lights, Trim Tabs, Hot and Cold Fresh Water Transom Shower, SeaDek Swim Platform Inlay, Bimini Top with Full Enclosure, Bow and Cockpit Covers, Cockpit Table, Cockpit Wet Bar with Refrigerator, Upgraded MB Quart Stereo with Wet Sounds 6 Channel Amplifier, Sub Woofer and 6 Wet Sounds Speakers, Cabin Sleeps Up to 2 People. Microwave, Flat Screen TV, DVD Player, Full Stand Up Head with Shower, Sink, Full Marine Head with Electric Flush, Dockside Pump Out, Shore Power, Silver Painted Arch, New Manifolds and Risers, New Batteries. Mercruiser Warranty in Effect Until 09/2017. You Won't Find a Nicer Luxury Bowrider!!! 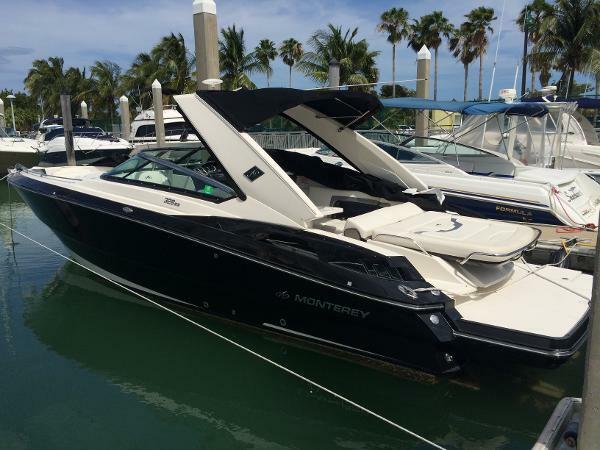 2017 Monterey 328 Super Sport 2017 Monterey 328 SS powered with Twin Mercruiser 6.2L V8 350 HP each. 700 hp. total. V-8's with unparalled torque and acceleration to get you on plane quickly and smoothly. The drives are Mercruiser Bravo II drives with stainless steel props. The motors and boat have Axius joystick. Move your boat in the marina like a video game, use a joystick. where ever you point the stick the boat maneuvers to. Also has Skyhook. Push the button and it is a GPS activated anchoring system. The boat has an all stainless steel electric anchor controlled at the helm for beaching or anchoring in the cover to enjoy the day. 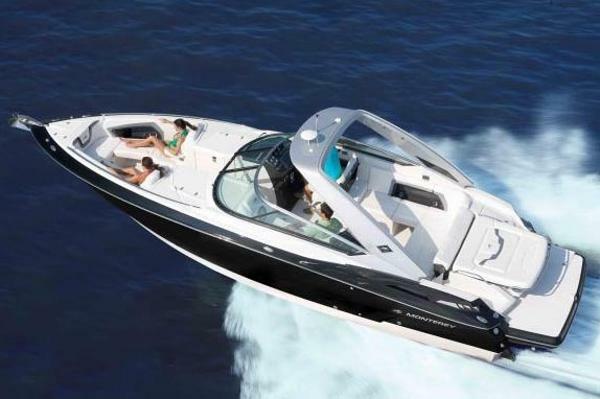 This boat is equipped with the following options: Axius Premier Engine option with joystick control. Gel Deck Stripe Onyx and Hull stripe Arctic Accents Neutral Graphics Canvas-Onyx Fabric interior Biltmore w/pillows and Fabric exterior Anthracite Grey. Windlass Anchor w/SS anchor/rope/chain. Docking Lights, Seadeck Swim Platform Inlay Grey, Underwater Lights. Bow and Cockpit Cover Canvas-Onyx Cockpit Inlay-Seadeck Grey, Cockpit Table Electronics Package( Raymarine VHF radio, GPS Raymarine Chartplotter, Stereo upgrade package with 6 Wet Sounds Speakers, Subwoofer, 6 Channel Amp & LED Speaker Lights Cabin AC 19" LED Flatscreen TV and DVD player Bow Filler Cushions This boat is loaded with options, and a must see.Stop on by the marina or give us a call if you have any questions or would like to get eyes-on the boat! 2017 Monterey 328 Super Sport Monterey 328SS on the Florida / Alabama Gulf Coast. 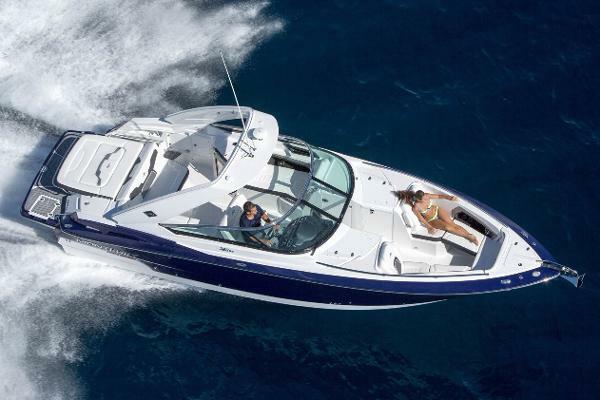 Redefining boating, the 328 Super Sport breaks all the rules. The 328SS is in a class of its own. 32'2" in length, this twin engine bowrider is a sleek and smooth machine packing a powerful punch. Features include a Monterey exclusive articulating sun island allowing for multiple seating and lounging configurations, a full head compartment with hot and cold water, and a spacious cabin that can accommodate two. Bring your family and friends along, seating areas are plentiful aboard the 328SS. Radar arch, and well appointed wet bar are only a few of the long list of standards available. Base Boat Pricing. 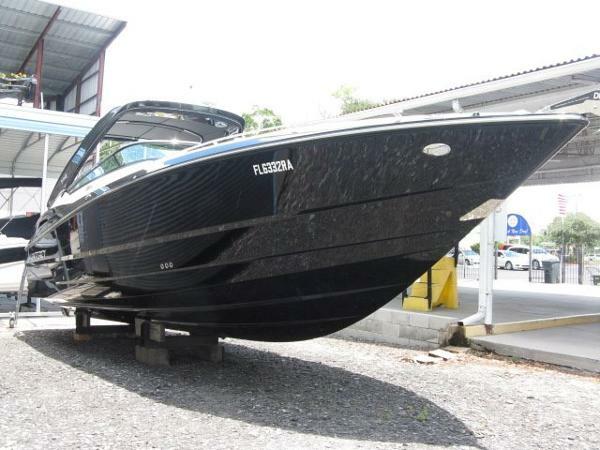 Contact Dealer for the Best Discounted price on a boat with your favorite options. 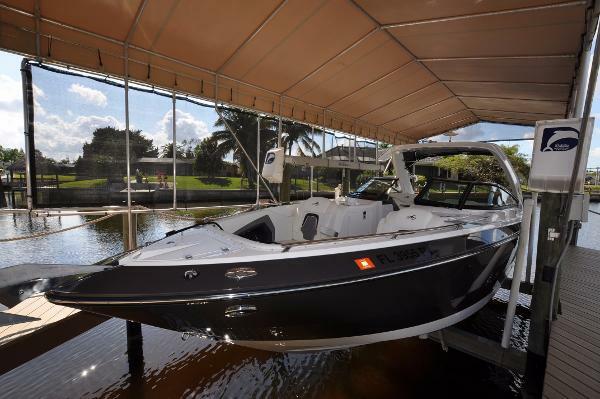 2013 Monterey 328 Super Sport Super clean boat, Joystick control system,one owner, Rack stored with only 87HRS Easy to show @ Marina Delray A creative blend of bold styling and innovative design, theMonterey 328 SS offers something different in the way ofbig open-bow cruisers. She incorporates all of the features ofa full-size bowrider with the added versatility of a small cabinwith sleeping berth, TV, and microwave within the portsideconsole. The profile of the 328 SS is distinctive; styling-wise,she definitely stands apart from the rest of the big bowridercrowd. Standard features include an extended swim platform,radar arch with overhead lighting, cockpit refrigerator,hot/cold transom shower, carry-on cooler, electronics cabinet,power engine hatch, in-floor storage, pull-up cleats, wet barwith sink, fold-down footrest (helm), numerous drink holders,enclosed head with sink (starboard console), leather-wrappedsteering wheel, trim tabs, and anchor locker. The aft loungeadjusts into several different seating positions—very clever.Note the anchor system with it’s chute and stainless steel bowplate. A well-finished boat, the Monterey 328 SS will cruise at25 knots with twin Volvo 320hp I/Os (mid 40s top). 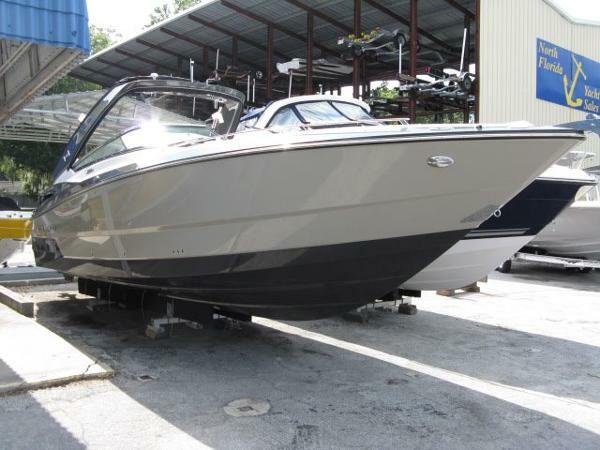 2013 Monterey 328 Super Sport Don't miss this clean, freshwater bowrider! Only 165 hours on her twin Volvo 300's with Duoprop drives. Please click on 'full specs' and inquire for more details! To serve you better, please contact us in advance to confirm location and ability to view this vessel. 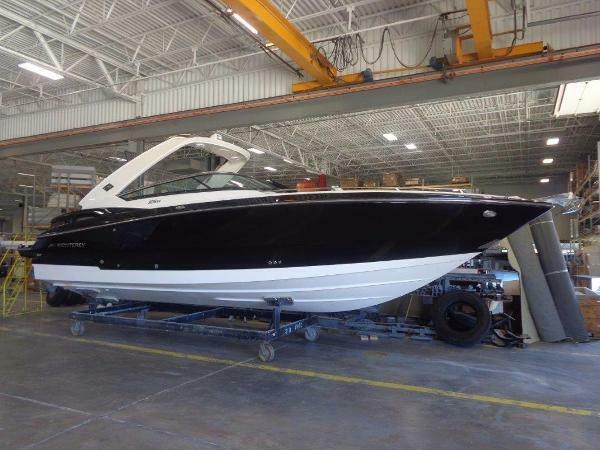 2016 Monterey 328 Super Sport 2016 MONTEREY 328 SUPER SPORT WITH TWIN MERCRUISER 6.2L (350hp) DTS BRAVO III; ONLY 36 ENGINE HOURS AND LESS THAN A YEAR OLD!! Mint Condition!! Kept in Dry Storage Since New. This Boat is Loaded Up. Upgraded 350hp Engines, Axius Joystick Control, Digital Mercury Smart Craft Gauges, Sky Hook, Garmin 7610 Chartplotter/Sonar, Garmin VHF, Upgraded Stereo with Fusion Deck, Wet Sounds Amplifier, Wet Sounds Sub Woofer, and Wet Sounds Speakers. Yacht Certified with Large Bow Area Seating, Stern Sun Island. Port Side Cabin Sleeps Up to 2 with 15" Flat Screen TV, DVD Player, Microwave. Starboard Side Stand Up Head with Vaccu Flush Toilet, Dock Side Pump Out and Macerated Overboard Discharge and Hot and Cold Shower. Cockpit Wet Bar with Cockpit Refrigerator, Windlass Anchor, Radar Arch with Speakers and LED Courtesy Lights, Shore Power, Battery Charger, Removable Ski Pylon, Docking Lights, SeaDek Swim Platform Inlay, Snap In Woven Carpet, Custom Full Mooring Cover and So Much More.... Enjoy Boating In Style!! This Boat is Gorgeous!! 2016 Monterey 328 Super Sport Sapphire Hull Color, Rio Accent Stripe, Bow Filler Cushion woven Snap-in Cockpit Flooring, Cockpit Table, SeaDek Swim Platform Inlay, Anchor Windless, Bow & Cockpit Covers (sapphire), Electronics Package (Ray E97 GPS/Chart- Ray 260VHF),Stereo Upgrade Package (LED speaker lights, 6 wet sounds speakers, wet sounds subwoofer, 6 channel amp), Docking lights, Remote Searchlight.